The Chicago Blackhawks have done what no one else has been able to do. They figured out how to sustain playoff contention every year since 2009, winning three Stanley Cups along the way. To most fans in Chicago, the key to their incredible success isn’t much of a mystery. The Blackhawks follow a strict system that utilizes a core set of guys who’ve stayed with the team ever since Stan Bowman got his hands on them. Bowman, the Blackhawks’ general manager, uses a system which allows his core players to stay intact by using “filler” players that operate interchangeably. Kris Versteeg is a great example of an interchangeable player since he was traded away and then traded back to fill a vacancy. Bowman finds players with low monetary value and turns them into high-value assets, which he then trades for multiple, lower-value players. Then, they’re developed into his fail proof system and the cycle begins again. The idea is that average players appear better on paper than they really are, although that’s not always the case. Sometimes these low-value players turned high-value assets continue to perform well once they leave Bowman’s system, as seen with René Bourque. The Chicago Blackhawks aren’t the only team whose designated a core set of guys with interchangeable pieces to carry them through a decade while following a strict system. The Los Angeles Kings can attest to that, as they’ve won a couple of Stanley Cups using a similar blueprint. Unlike the Chicago Blackhawks, though, the Kings weren’t able to sustain their system as hoped. Did you know that over the last decade, the Montreal Canadiens, the New York Rangers, the Philadelphia Flyers and the San Jose Sharks have all played in more playoff rounds than the Los Angeles Kings? In fact, since the Carolina Hurricanes won the 2006 Stanley Cup, no team has played in fewer playoff rounds and won a Stanley Cup, let alone two Stanley Cups, than the Los Angeles Kings. There’s something to be said about teams that sustain playoff contention over time. It says something about the team’s coaching staff and their ability to work well under pressure. It speaks to their player development tactics and their management’s ability to turn a profit. All this is fuelled by the scouting department’s capacity to find and scout players at a more efficient rate than other teams and that’s how they’re able to stay afloat. On top of all that, the Chicago Blackhawks have somehow managed to stay relevant and evolve with the league as younger, faster players flood the scene with unprecedented skills. So how have the Chicago Blackhawks managed to sustain success for so long? Well, it might actually have something to do with college hockey and the unique benefits NCAA programs have to offer. Bowman is a graduate of the University of Notre Dame and so he’s personally experienced the benefits of playing in the NCAA. Although he never played in the NHL himself, many of the league’s greatest minds came from small beginnings. As the league changes over time so does the way the game is being played and with each new era comes new talent and systematic styles of play. One of the biggest changes taking place can be seen in the role of defensemen. Simply put, coaches want more out of their blueliners and they’re willing to pay a pretty penny for anyone who gives them what they want. In fact, as the role of defensemen evolves, so too are the ways in which they’re being developed. The evidence shows us that the league’s top, young defensemen drafted after the first round and who spent at least one season developing in the NCAA are out-performing their CHL counterparts drafted in the first round. So what does this have to do with sustainability and the Chicago Blackhawks? 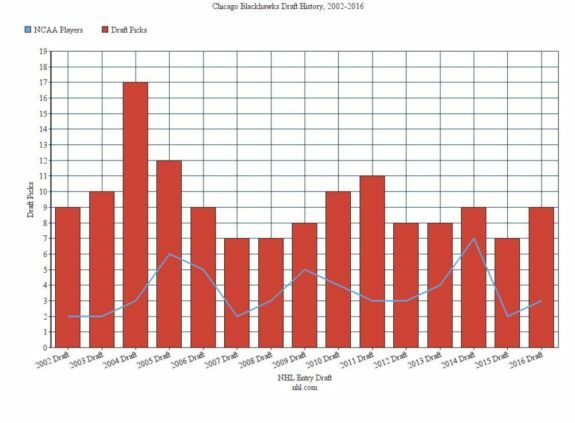 Players drafted after the first round don’t cost as much as players drafted in the first round. Look at Jimmy Hayes for example. 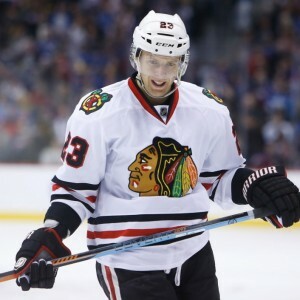 He was drafted by the Chicago Blackhawks in the second round of the 2008 Draft and made $612,500 in his first NHL season. 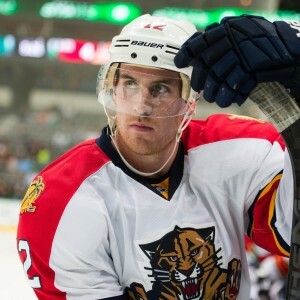 Ben Smith was a sixth-round pick in the 2008 Draft and made $580,000 in his first NHL season. Jack Skille was a first-round pick in the 2005 Draft and he started making $850,000 in his first NHL season and Nick Schmaltz, a first-round pick from the 2014 Draft is making $925,000 in his first NHL season. And yes, all of these guys have played at least two seasons in the NCAA before cracking the Blackhawks’ roster. From this point of view, Bowman clearly designates a decent portion of draft picks to those from the NCAA. However, this chart doesn’t tell us a whole lot more than that. Even if we just look at NCAA-developed draft picks categorized by position, there’s really no perceivable patterns found in his drafting techniques. 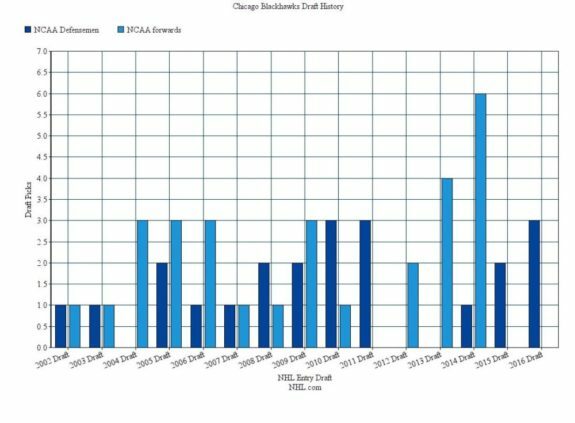 However, patterns can be found if we categorize draft picks by periods of time. Bowman always drafts more forwards than he does defensemen but for a while now, he’s been decreasing the percentage of forwards drafted and increasing the percentage of defensemen drafted. What’s more interesting is the percentage increase of NCAA-developed players, particularly with those who play on the blue line. NHL general managers are willing to pay a premium for young defensemen with positive trajectories. If the Chicago Blackhawks are already in the business of flipping players for more than what they’ve paid for, why not invest more in players coming out of the NCAA? Well, it looks like that might be exactly what he’s doing. Bowman’s track record has proven this strategy to be an excellent return on investment, even when including the handful of NCAA-developed draft picks that never turned a profit. Furthermore, the time for replenishing Bowman’s core group of players isn’t that far away either, especially on the backend. 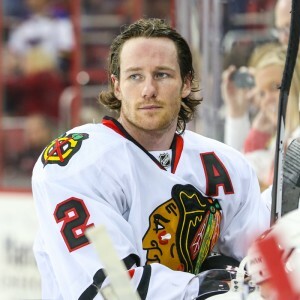 Duncan Keith will be 34 years old next year and Brent Seabrook will be 32. Keith’s contract doesn’t end until 2023 but his salary’s already engaged in a downhill trajectory. Seabrook’s contract isn’t up until 2024 and yes, he’s getting paid the most he’s ever made but in this day and age, playing in the NHL during your mid-30s isn’t as common as it was a decade ago. Perhaps this is another factor contributing to Bowman’s higher-than-usual NCAA-developed defensive draft picks. Perhaps he’s in the midst of selecting a new defensive core and if that’s the case, he’ll probably aim for more NCAA-developed defensemen at the 2017 Draft.